1. To befuddle, to confuse, to rattle, to mix up, to discombobulate: The problem is that if anyone tries to use logical explanations for some political positions, it just addles the listeners and makes their understanding more confusing than comprehensible. While Rodger was walking along the dark street late at night, his brain was addled by fear of what might happen to him. 2. To rot, to decay, to putrefy: The eggs were addling because they were not refrigerated and were on the shelf too long. 3. Etymology: from a Middle English word from the Old English adela, meaning "liquid filth". 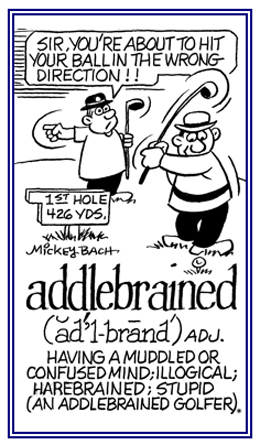 It’s related to the German adel, meaning "urine, mire" or "puddle". 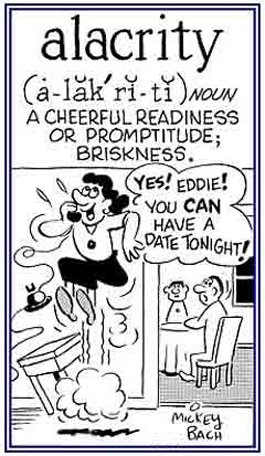 A dimwit, an idiot, an imbecile, or a moron: Jane said, "Oh, no, I'm an addle-brain. I didn't mean to put salt in the coffee instead of sugar." There seems to be too many addle-brains who are thinking about running for President of the U.S.
1. Dull-witted, stupid, and confused: A addle-brained politician admitted that he had been participating in several inappropriate electronic relationships with some women. 2. Crazy, weak, mentally deficient in some way: Is it possible that the man was addlebrained when someone knocked on his door at the hotel and he opened the door while he was still completely naked after taking a shower? © ALL rights are reserved. A reference to having a muddled or confused mind; foolish, silly, or illogical: Ryan asked for a minute to clear his addled brain when he was asked a question which he was not prepared to answer. 1. 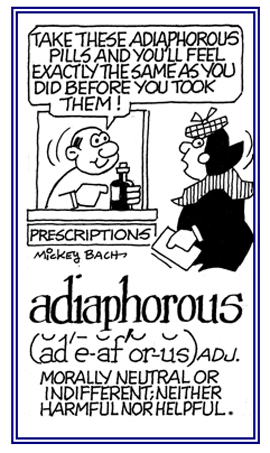 A description of anything that neither benefits nor harms: The adiaphorous placebo the doctor prescribed had absolutely no medical benefit for Josh. 2. 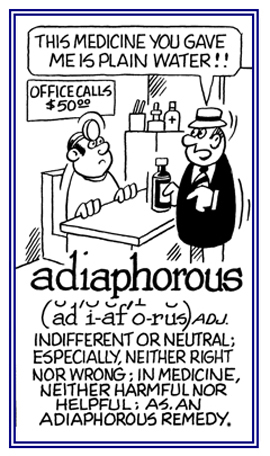 A reference to anything that is neutral, neither right nor wrong, or indifferent: The adiaphorous attitude of the student resulted in his failing to pass his exams and no longer getting any financial aid from his parents. 2. Etymology: from Greek adiaphoros, from the negative prefix a + diaphoros, "different"; that is, "making no difference, of no consequence". © ALL rights are reserved. To improvise all or part of a speech or another kind of performance; that is, to spontaneously say something without prior preparation: Many in the audience noticed that the mistress of ceremonies was ad-libbing her speech at the awards ceremony. © ALL rights are reserved. 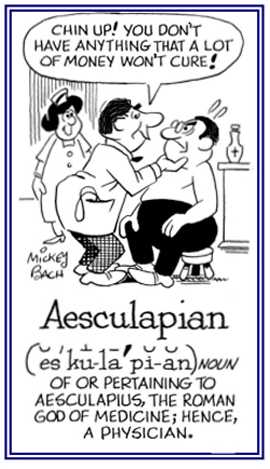 Relating to the art of medicine, or a medical practitioner: Aesculapius was the Greco-Roman god of medicine, or the healing arts, and so an Aesculapian professional usually refers to a physician or to a medical doctor. © ALL rights are reserved. 1. Struck by shock or with terror or horror: Sabina was aghast at the thought of having to walk across the narrow bridge spanning the deep chasm. 2. 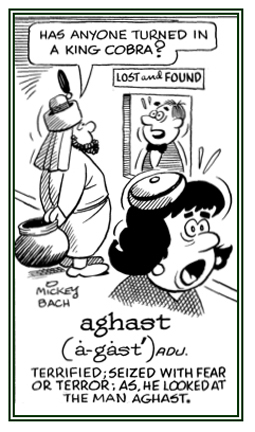 Etymology: from Old English gæsten, "frighten," which comes from gæst, "ghost, spirit". © ALL rights are reserved. 1. Relating to being intensely excited or eager: Max and Mariam are agog to see all the sights in Paris. 2. Referring to great interest in some action: The news about the new laptops has computer users agog. 3. 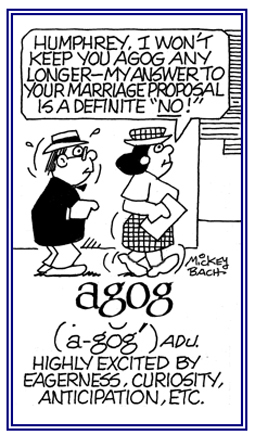 Etymology: from Old French a gogue, "joke, good humor, joyfulness, merriment"; from gogue, "fun"; of unknown origin. © ALL rights are reserved. A reference to that which prevents sleep, or produces wakefulness; such as, a drug, strong tea, or coffee: The doctor advised Karen not to drink coffee at night because it usually produces an agrypnotic condition that keeps her awake. Click on this agrypnotic link, if you want to see more words that are related to it. 1. To help a person, or people, to commit a crime: The lawyer's client was aiding and abetting the bank robbers by driving the getaway car. 2. Etymology: This terminology is considered to be a lawyer's redundancy since abet means the same thing as aid, which gives credence to the old rumor that lawyers used to be paid by the word as illustrated by the following statements as shown below. To help, assist, or to facilitate the commission of a crime, to promote the accomplishment thereof, to help in advancing or bringing it about, or to encourage, counsel, or to incite as to its commission. Aid and abet includes all the assistance rendered by words, acts, encouragement, support, or presence, actual or constructive, to render assistance if necessary. St. Paul, Minn; 1990, page 68. A reference to helping, assisting, or facilitating the commission of a crime and to promote the accomplishment thereof; as well as, to help in advancing or bringing it about, or encouraging it, counseling, or inciting its commission: The lawyer tried to reassure Jim that the aiding and abetting charge would not hold up in court. Aid means "to support, to help, to assist, or to strengthen". Act in cooperation with; to supplement the efforts of another person or other people. 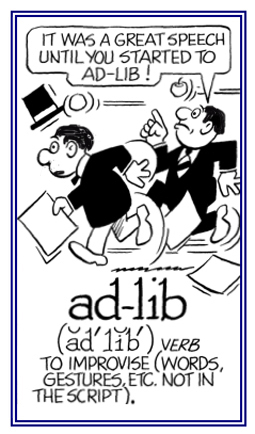 Distinguished from abet, aid within the aider and abettor statue means "to help, to assist", or "to strengthen"; while abet means "to counsel, to encourage, to incite, or to assist" in the commission of a criminal act. West Publishing Co.; St. Paul. Minnesota; 1990; page 68. 1. Normally a reference to a person's peppy behavior: Jimmy's alacritous behavior was his reaction when his mother told him that he could buy something in the candy store. 2. A quick and cheerful willingness to do something: Dorinda's alacritous acceptance of the invitation to the party surprised her parents. 3. A descriptive term for a certain mood or a tempo of a musical composition, indicating how the music should be played: The concert had several sections of alacritous rhythms. 1. 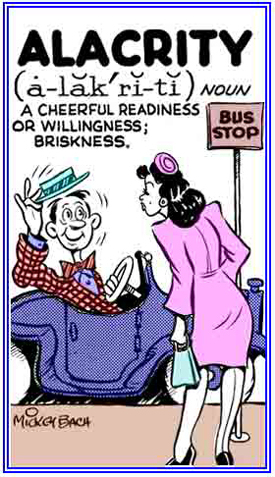 A quick and cheerful readiness to do something: Floy and Renate prepared for their European trip with alacrity. 2. Promptness or eagerness and speedy readiness to respond to something: Bryan answered the call for assistance from his supervisor with alacrity. 3. Agility and nimbleness: Despite Mike's advanced age, he moved around with alacrity. 4. 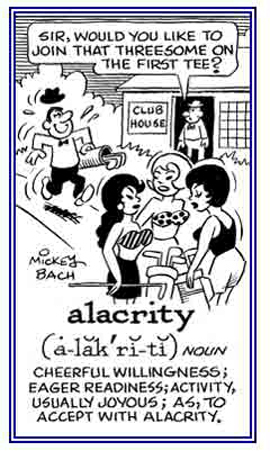 Etymology: from Latin alacritatem, alacritas, "liveliness, ardor, eagerness"; from alacer, alacris, "cheerful, brisk, lively"; of uncertain origin. © ALL rights are reserved. 1. A device for giving a warning of danger: The new fire alarm was installed in Ethan's apartment the other day. 2. A security device installed in property; especially, a house or car, to make a warning sound if a break-in or theft is attempted: The new system for the crime-prevention alarms were very loud and so they would help protect the store from criminal invasions. 3. Clocks or watches that will sound off when set: There are time mechanisms that provide alarms for people. 4. Fear caused by the perception of or the sudden sense of imminent danger: Chrissy's parents have expressed alarm about her safety when she goes hiking in the mountains. 5. Etymology: from the old French summons to battle a l'arme!, "to arms!" It seems to be a far cry from the modern alarm clock; yet, that is actually the content of the word's development." A l'arme! was first the call itself and then, in the form alarme, it became the name of this sudden summons. The English alarm, which comes from this origin, first had the same meaning, but gradually broadened to indicate a warning signal of any kind of danger, and then the apparatus for giving this signal; such as, a fire alarm. It is interesting to also note that alarm has developed an additional meaning: the fear which results from a warning of danger. Springfield, Massachusetts, U.S.A; 1933; page 13. Showing page 3 out of 7 pages of 103 main-word entries or main-word-entry groups.